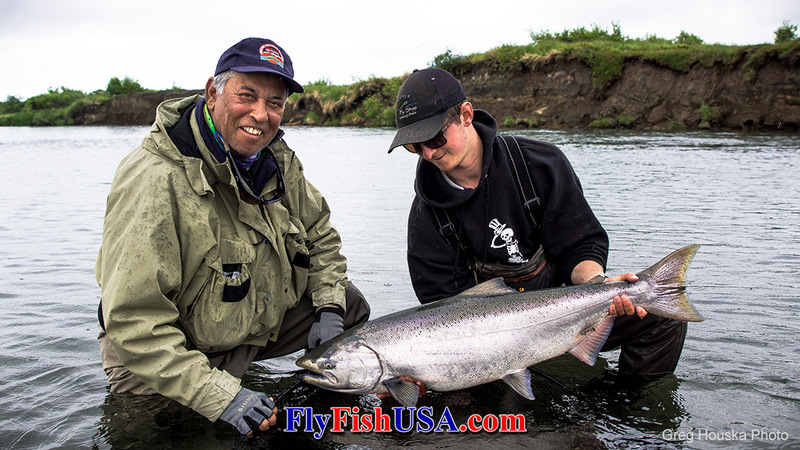 "The Killer Krill, or Kriller Series, was conceptualized and constructed on western Alaska’s Kanektok River by Alaska West guide, Greg Houska. Starting as a tube fly in June, the Kriller effectively found it’s way to being tied on a shank by August. After a full season’s worth of tweaking, trial and error, and most importantly peer review from creative fellow guides, it became ever more productive. Today the final version maintains the unique features that the pattern was built around; having it’s action closer to the hook and a downward/diagonal presentation in the water column while swinging. The main station of the pattern is tied around dumbbell eyes at the shanks' rear which keeps the focal point intentionally close to the hook. This is because it’s long been believed that steelhead and king salmon attack swinging flies by crushing the head/body of the fly, not eating it from the tail up. Sized ideally for coastal steelhead at just under 3.5” the pattern also fills a niche for Chum salmon, and as a smaller fly for King salmon on sunny days, or low water or clear water conditions. While the Kriller was designed for swinging with two-handed rods, the single hand application is endless, especially for Pacific salmon in Alaska." Hi my name’s Frank Day and I am the fly manager here at The Fly Fishing Shop. I first heard of Greg Houska’s Kriller from Alaska west guide, good fishing pal, and coworker Hawkeye Hawkins. The fly was different, and something that I decided right then and there that I wanted as an addition to our anadromous fly selection. The Kriller is somewhat unique in its design. The eyes being in the rear of the fly give it a very squiddy, as well as a krill appearance. It’s no secret that both squid and krill have a high importance for anadromous fish during their marine feeding. Squid are extremely lipid rich and allow anadromous fish to maximize ocean growth. Both Mark Bachmann and I have experimented with squid type flies for steelhead and salmon. Each of their versions has successfully proven itself and none of the takes have been very dull, reel explosion is I believe the preferred vernacular. 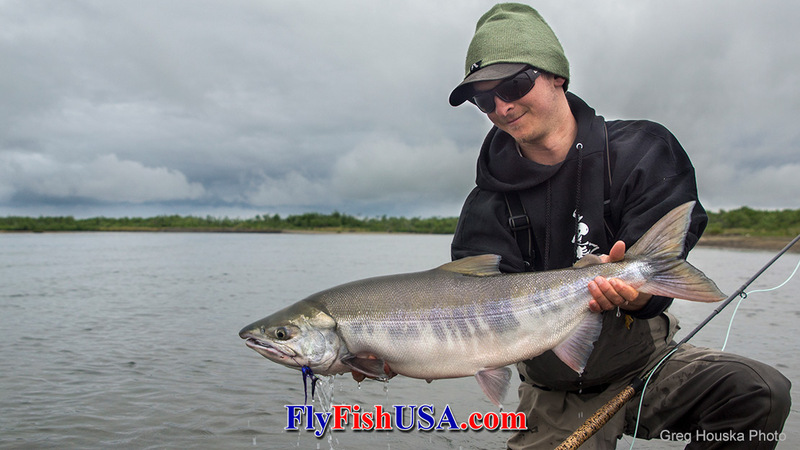 The Kriller is a born winner to us and has proven itself quite adequate for a variety of anadromous critters up on its river of creation the Kanektok. The eyes being in the rear also give it a downward angle while swimming. 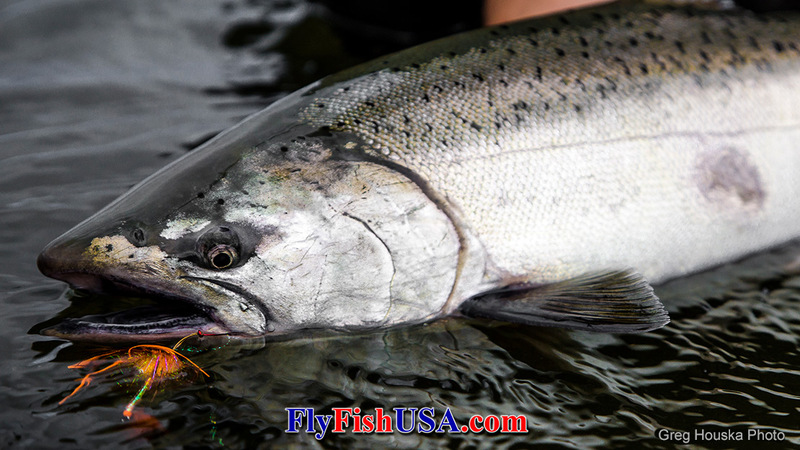 From our experience when an anadromous fish such as a salmon or steelhead perceives something to be running away from it, often a chase response occurs in an aggressive fish. Many times when fishing a seam your fly is slowly swinging through the soft spot and as the rear end of your head starts to re-enter the faster current on the outside of the seam your fly begins to accelerate. This is often times when the grab comes. The fish has seen the fly, tracked it, and now it is cheekily attempting to escape and it must be destroyed! The diagonal angle of The Kriller takes this theory and applies it in a vertical fashion instead of a lateral one. When feeding in the ocean, there are very few places that predatory anadromous fish can concentrate schools of prey. Often times the only “wall” a hungry steelhead or salmon can drive their prey against is the surface barrier itself. I have personally seen on multiple occasions, schools of fall chinook driving balls of herring and anchovies to the surface. The Krillers orientation in the water gives it the appearance of a prey item fleeing upwards and takes advantage of that vertical response. 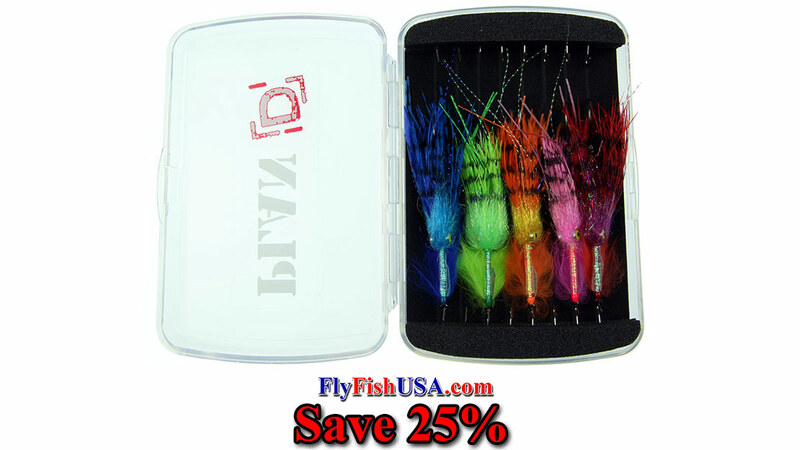 We think this fly is a little different in appearance and the way it fishes compared to usual fuzz on a hook or tube. So the next time you’re trying to pick your buddies pocket, fish something a little different and tie on The Kriller!